Well, the weather was crazy-amazing here in Missouri over the weekend. The thing about the mid-west is that you can never trust the weather. It could be 100 degrees or snow tomorrow, you just never know. I won't be packing away my summer things for another couple of months. I wanted to share some of the new designs that my pals over at Culture Flock have come out with. As you may already know, I do photography (and model- obvs) for them periodically and am particularly in love with the new summer additions to the webstore. If you like cute things, pop over and give them a look-through. They are good, good people making really fun stuff. These are so cute! I was just thinking how I needed some new graphic tees. That sloth one in particular is adorable (really, anything with sloths is adorable). Super cute! I think my favorite is the sloth tank. Don't you have a bag with a sloth on it? I feel like I have seen that before. Yeah, it is pretty toasty here in Ohio. I don't think we will have fall weather for a little while yet. Have a lovely day! Wowza yeah they do. That last tank? I'm smitten. I don't think a person ought to be smitten with a tank. I am. Oops. You have the sweetest face when you nearly smile. ^-^ Love these shirts! Aw, thank you so much, Carly! xo. you are so cute!! love these tanks! Love the sloth- suns out guns out tank! LOVE the "Go make something" tank! Unfortunately it's just about time to pack away all the tanks over here in NC. Anything with a sloth on it is cool in my book. 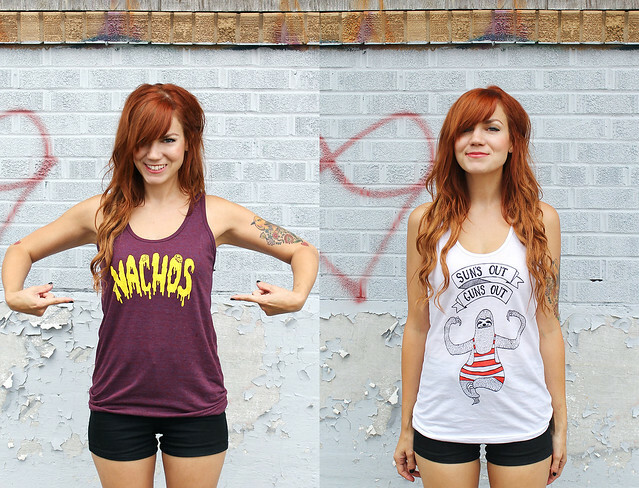 It'd be great to walk into the gym wearing the nachos tank, haha. I think we can all agree the sloth tank is the favourite. I love the illustration and use of typography. I will check their site. So obsessed with your hair! These tank tops are really nice !! 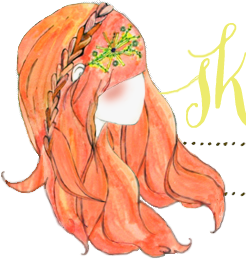 Your hair looks amazing! You are sooooooo pretty! I love the sloth one, so cute! I NEED the sloth guns out tank in my life like RIGHT NOW but it's not on the site! Booo! that sloth tee is THE BEST THING EVER! totally going to order it. These shirts are so funny!